Poor Katie (and by default poor Mummy and Daddy) had the rage of all rages this evening. All over a star. 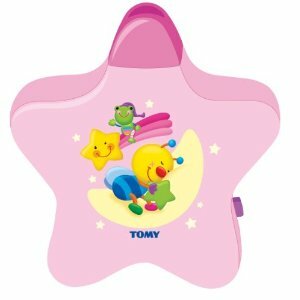 A pink musical star that projects a little teddy bear onto the ceiling and plays lullabies. A pink musical star that was usurped by the musical night night dog that is currently playing beside Katie's bed. A pink musical star that doesn't really get played with much, other than to use it as a reading light. What has happened this evening I hear you ask that has created anarchy and mayhem in our household? Well I suspect combination of things. My nearly 8 year old nephew is sleeping over tonight and I thought it would be a good idea for both children to go to bed at the same time (usually I stagger the bedtimes and get 30 minutes of Katie playing up until he comes up to bed). So, my clever thinking was let Katie stay up half an hour later and put them both to bed at the same time. Both children thought this was a great idea. They had baths and then settled down to watch a film. All great so far. Great that was until bedtime and I let my nephew borrow the pink star to keep him company in bed and all hell broke loose (thank heavens Katie wasn't aware that I'd also lent him a Winnie the Pooh Bear but suggested that he hide that under the covers so she wouldn't notice it!). I suspect that Katie was over-tired. We've had a busy day filled with swimming and a trip to a local arboretum for (in Katie's words) "a lovely long walk". She has been a little emotional at times today so a slightly later bedtime probably wasn't a brilliant idea but I was hoping that that would prevent the usual messing around when our nephew stays over. Katie is prone to the 4 year old tantrums that plague girls and boys at around this age but tonight she was raging. Red in the face, screaming and shouting at me to get the star back with angry tears streaming down her face. She was seriously angry. I should just point out at this moment in time that all this took place whilst Katie was on the loo! What on earth do you do in that situation? Have you ever tried to wipe the bottom of a child in mid-rage? I wasn't going to give in to such behaviour. I actually found it really hard not to laugh (I suspect that must be a protective sort of reaction in the face of such anger). I don't like seeing anyone that upset and angry especially my daughter. I wanted to just make her feel better but I knew that I couldn't allow such behaviour to result in the return of the star. In the end I held her (once she was off the loo) until she calmed down a bit and put her into bed. I made it very clear that the star was staying in the other bedroom and it was time for bed. Daddy and I did shifts with each child to settle them both down. As I type this it is all quiet on the Western Front! Katie has probably worn herself out. I will be going out to buy another musical dog I think for the next time my nephew stays over. Tonight does answer me one question, Katie is not ready to do a sleep over with her Auntie and nephew. Maybe if it's on a night when he is staying with his Daddy it might work but, emotionally, I really don't think she is ready at the moment. She is currently feeling very jealous of my relationships with other children and I wouldn't want another person to have to manage those emotions and the resulting behaviour. We are going to work on my sister putting Katie to bed at our house though to start getting her ready. You sound like you handled things well. Both kids are asleep - result! I wonder whether Katie would react the same at someone else's house? I know that Mini is always fine at Nanna and Grandads (it's the day after when we get the reaction), and they don't get any of the usual problems that we do. Having said that, it's just him then and no cousins to 'compete' with. This is a really good post. we haven't adopted yet, but do you know, or have you learned the difference between a normal upset child, and Katie getting upset because of something linked to adoption. Or is it never that clear? theonehandman: That's a tough question and, as you've already guessed, hard to answer because it varies according to the child. I think you get to know your own child and what triggers them individually and that's the same for birth children and adopted children. That helps you avoid looking at the child as adopted and helps you see them as themselves and what are issues for them. Katie definitely has some underlying anxieties although is mostly outwardly confident. She gets anxious and upset when trying new things if she thinks she can't do something and worries that people will laugh at her. I could put that down to the fact that she is adopted and had some big changes in her life so feel anxious about new things or it might just be part of her personality and, under different circumstances, might have existed as well. Some things like attachment disorders become more clear as being linked to the adoption but with generally getting upset, I think, with Katie, much of it is because she is 4 and is frustrated about control. They have a very inflated sense of justice at this age and are very egocentric so they get upset over the slightest thing. I've talked a lot to other parents of girls and boys of the same age and Katie doesn't seem much different than their children. They are all having big meltdowns over the smallest things. There is a lot of change coming in their lives as they prepare to start school and we're trying to help develop their independence and they don't always want to do things like wipe their own bottoms (as Katie said to me "It's disgusting!") or get dressed. They want us to do that for them so you have lots of battles. So I think I'm saying that much of her behaviour is typical 4 year old behaviour and fairly mainstream. Her anxieties seem to lie within losing me and trying to understand why she didn't grow in my tummy. It's a lot for an adult to take on board, let alone a 4 year old child. She currently has an issue with my relationships with other children and what my feelings for that child might be. Her life story book has now been completed and will hopefully be sent out to us soon and I'm hoping that will help her a bit as well. It's an ongoing process and things that don't bother her now may bother her in the future. I do wonder if adopted parents (myself included in that) are on the look out for things that are related to the adoption more so than birth parents. I hope that answer helps somewhat and isn't too ambiguous. Best wishes and good luck. Britmums Live Here I Come! I'm off to Brit Mums Live! And a bit of diddly-dum!